Sentiment analysis is at the forefront of human capital management (HCM) technology innovation. It’s time for your organization to jump on board. Artificial intelligence (AI) is a vital tool in the workforce today; it helps you understand industry trends and measure employee engagement levels. It can even help you identify how your employees truly feel, using a technology called sentiment analysis. Sentiment analysis uses natural language processing (NLP) to gain an unbiased insight on how your employees are genuinely feeling. Matt Charney, Executive Editor of RecruitingDaily, dives into the challenges faced by modern organizations in gauging employee sentiment and the evolving tools for analysis that can assist managers and executives. 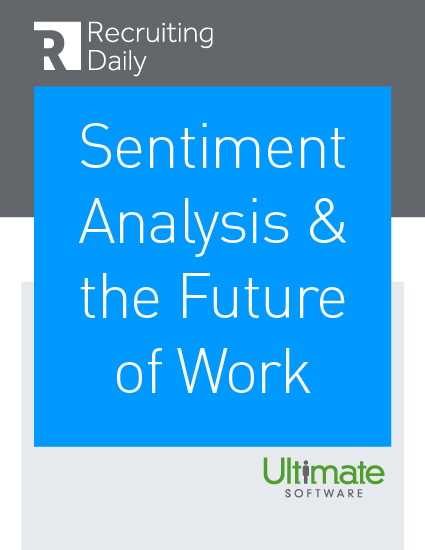 This guide offers a quick history of sentiment analysis in the workplace, and highlights powerful current and upcoming trends in technology and management. Please fill out this brief form to access your HRIS Technology guide.